DA Form 591H - also known as the "Rotc Supplemental Service Agreement (army Chaplaincy) (to Rotc Contracts Executed On And After 1 June 1984)" - is a Military form issued and used by the United States Department of the Army. The form - often mistakenly referred to as the DD form 591H - was last revised on October 1, 1985. Download an up-to-date fillable PDF version of the DA 591H below or request a copy through the chain of command. For use of this form, see AR 601-25; the proponent agency is the Office of the Deputy Chief of Staff for Personnel. 50 USC App 456(d)(1); 10 USC 275.
preparation for the Army chaplaincy. SSN is used to identify the individual. make you ineligible for consideration for this delay. This information should be carefully studied before acknowledging. Sign all copies and attach one DA Form 591h to each copy of DA Form 591.
with the following service requirements if my request is granted. a. To faithfully pursue a full-time course of religious study in preparation for the Army chaplaincy. seminary, or ordination, whichever is later. 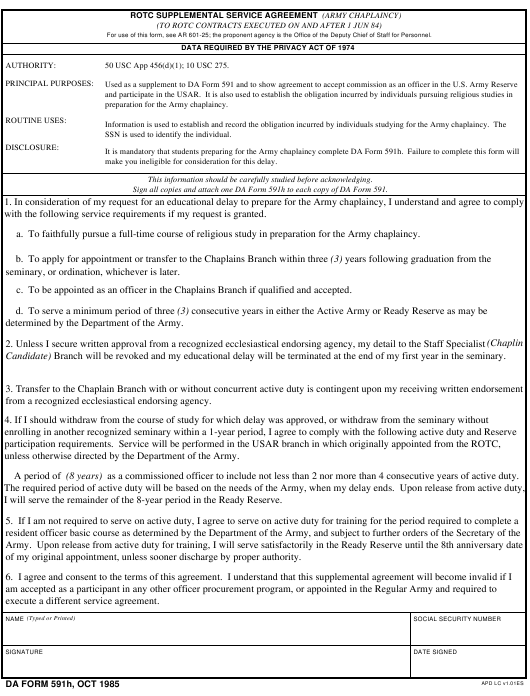 c. To be appointed as an officer in the Chaplains Branch if qualified and accepted. determined by the Department of the Army. Candidate) Branch will be revoked and my educational delay will be terminated at the end of my first year in the seminary. from a recognized ecclesiastical endorsing agency. unless otherwise directed by the Department of the Army. A period of (8 years) as a commissioned officer to include not less than 2 nor more than 4 consecutive years of active duty. I will serve the remainder of the 8-year period in the Ready Reserve. of my original appointment, unless sooner discharge by proper authority. execute a different service agreement.